This is my Trans Gold Gibson Les Paul BFG that I bought in January 2008. The Les Paul BFG series, BFG standing for Barely Finished Guitar (a more apt acronym I have yet to come across) was one of those guitars Gibson produced that would make you stop in your tracks. Like a fingerprint, each rough-hewn top was unique and one couldn't help but be drawn in by those three-dimensional bumps and ridges. It was a strange combination of being repulsive and beautiful at the same time. And I sure wasn't crazy about the ones in the color Gibson dubbed 'Trans Black'. It reminded me of something altogether reptilian. Snakes alive! If you read my earlier article on How To Choose A Guitar That's Right For You, I talked about how some instruments just seem to scream, "Take Me! ", the moment you start playing them. The first Les Paul BFG I played was one of those instruments. This story all began with my visiting the local music store one day for some strings. Ryan, one of the sales guys at the store ushered me into the store's humidity-controlled 'expensive guitar room' with the promise of something wonderful that he had just discovered. I have to admit that I was a little disappointed when he put this goldtop BFG in my hands. 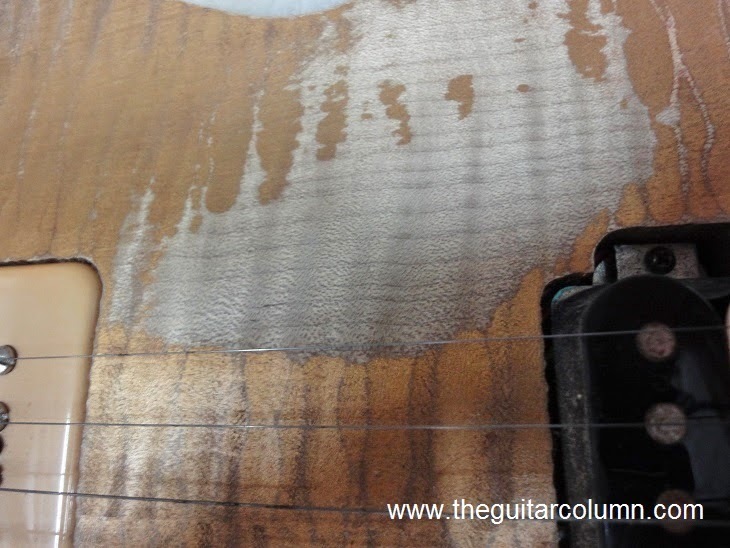 The raw-finished mahogany neck appeared dried out, with streaks of white in the wood grain, and there was a very noticeable burr mark at the heel which wasn't sanded down properly. Barely Finished Guitar. No kidding. Plugging it into a Peavey JSX head and 4x12 cabinet, Ryan dialed in a gainy, but not overly saturated tone on the Crunch channel with the bottom-end beefed up courtesy of the Resonance control. Let me just say that the combination of this guitar and this amp had me at 'hello'. Or maybe it was more like a very enthusiastic "Hey, how ya doing? Come here often?" Single notes screamed with liquid sustain, like balls of mercury colliding in mid-air, while riffs on the lower strings seemed to leap out of the amp like rampaging stallions in heat. And I was just there to buy some strings and a patch cable. Honest! After a couple of days of soul-searching about whether I really needed another guitar -- you know, the usual self-talk with the inevitable rationalization at the end -- I decided to go get it. But when I got to the store the Gold BFG was gone, replaced with a Trans Red one. The Trans Red unfortunately, sounded anemic through the same JSX amplifier and it had a nut that was cut too low, causing a couple of the open strings to buzz. I wasn't surprised really, that the Gold BFG was snapped up so quickly. It was a great guitar with vibe in all the right places. Since they didn't have another BFG at this store, I hightailed it for the store's other outlet, hoping that I would luck out and find one that had at least 80% of the mojo the goldtop had. The other store had a Gold Les Paul BFG displayed right next to its Trans Black reptilian sibling. Since I have a fear of snakes -- black ones, in particular -- I gingerly reached for the Gold BFG, being careful not to arouse the Trans Black one from its apparent slumber. There was way too much neck relief on this guitar and any attempt at playing anything else other than blues licks felt like a plod through thick mud. 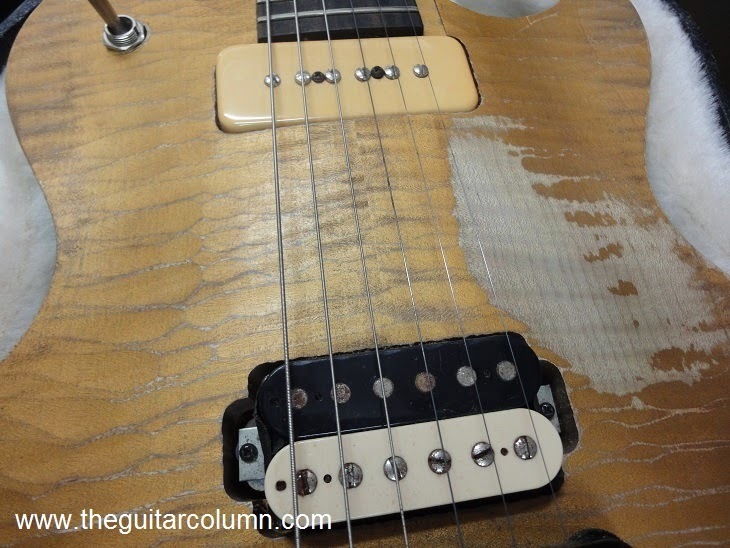 Gibson, in their enlightenment and keeping to the true spirit of a Barely Finished Guitar, chose to not supply a truss rod cover on the BFG's, which meant that I could access the truss rod directly with the supplied truss rod adjustment tool. A full turn later and the neck was straight as an arrow, with about .007" relief at the 7th fret. Magic number 7. Works every time. 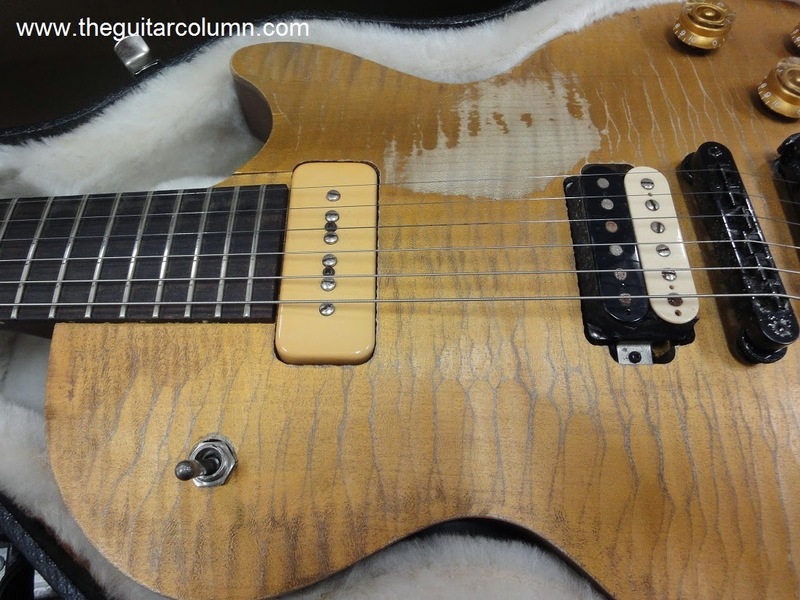 I noticed that this particular guitar had a cleaner finish than the other Gold top. No burr marks anywhere on the neck that I would need to sand down later, and it had a one piece mahogany back to boot. Looked promising. Locating a Peavey JSX combo amp, I put the guitar through its paces. I won't lie. This guitar didn't have the same "Take me!" vibe of the other guitar, but it had a lot that I could work with. I thought it had more of a vintage tone instead of the searing modern sound of the other Gold BFG. Could it have been the amp? Maybe. But the Peavey JSX combo I was playing through was not that far moved from the head and cab version. The combo version was pushing 2x12 speakers, so much of the difference that I was hearing was coming more from the guitar. Long story short, I sprung for it. Having played the guitar for a couple of years at a lot of gigs, I managed to wear the thin gold finish off with my picking hand -- the good sized patch of bare wood you can see in the picture. And the more the wood was exposed, the more I noticed the flame maple top peeking through from underneath. I'd put my BFG back in the case after I got my Gibson Firebirds, but when I took it out again recently to show a friend, and having not seen the guitar in a while, I was really struck by the figure of the exposed flame maple. I decided I needed to refinish the guitar in a transparent nitrocellulose finish to expose what I hoped would be an amazing flame top. I realized that doing so could be a bit of a gamble as the flame might only be isolated to that area. After all, why would Gibson hide an amazing looking flame top under an opaque finish. At worst, sanding down the top to the bare wood could reveal one or more large knots staring back like horrendous, unseeing eyes! 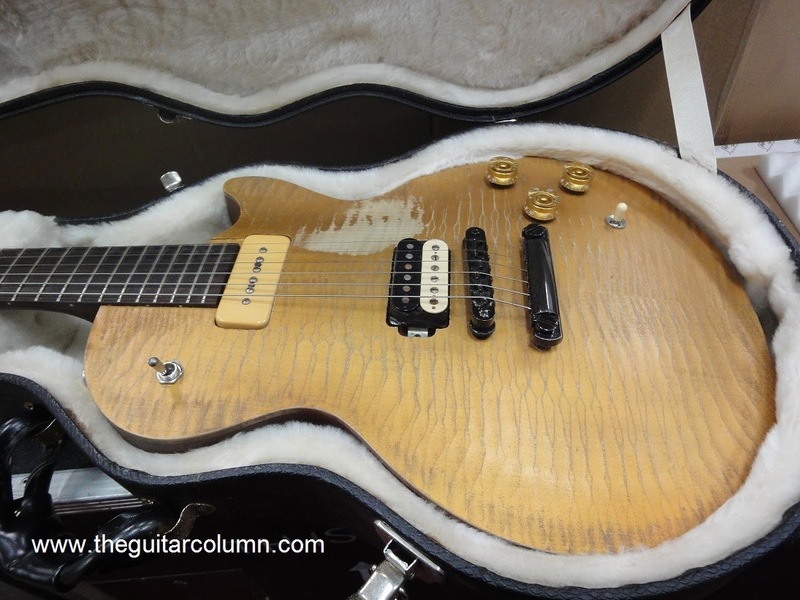 Might be a nice flame top hiding under there! At any rate, I needed to locate a good luthier that could do what needed to be done.